Fairly close to Luxembourg (about a two hours drive) there is this Reims. I have to say that in the five to six years living here I've never had the urge to visit it, but I did on the first proper summer's day of this year. And the reason I was so eager to go to Reims was an exhibition dedicated to Queen Marie of Romania. A few words cause maybe you had no idea of this incredible personality. Queen Marie of Romania was born into the British Royal Family as Princess Marie of Edinburgh, the daughter of Prince Alfred, Duke of Edinburgh (son of Queen Victoria) and Grand Duchess Maria Alexandrovna of Rusia (daughter of the Tsar Alexander II of Rusia). After refusing a proposal from her cousin, the future King George V, she was chosen as the future wife of Crown Prince Ferdinand of Romania in 1892. Marie was Crown Princess between 1893 and 1914, and became immediately popular with the Romanian people (wiki). This is in a few lines how she arrived in Romania. I've discovered her when I was a teenager, visiting with my family the Pelișor Castle in Sinaia, decorated by her, and if you happen to find yourself there you will surely discover the functionality of the place. Almost always when I visit castles that were inhabited I go from one room to the next, the audience room, the reading room, the bedrooms and so on, and I could not imagine someone from this present time living in there. But Pelișor is somehow functional, it makes sense, it is liveable. After that visit, I've started reading her memories and then other books written by her and discover her accomplishments. She was the big promoter of the Romanian National Costume, wearing it and encouraging the women in her entourage to also have costumes made. My beloved Romanian blouses are part of that National costume. I even traced her footsteps in Iasi, because during the First World War they had to evacuate Bucharest and rule the country from my hometown. After that war, she was the force that led to Romania being united in almost the same territory as today. In her long lobby with the British and French forces pleading for a united Romania, she visits Reims after it being destroyed by the war. So you see it somehow makes sense that an exhibition dedicated to her to be opened in that French town. After this long intro, let's talk about the exhibition. First thing first, it is good that it exists. Romania in general has a certain face for the French people and that impression, that stereotype is something that we (the ones living so close to France) have to battle almost daily. I would have brought to Reims the products of today's Romania and not something from the glorious past, but I dare to dream it is the first step. 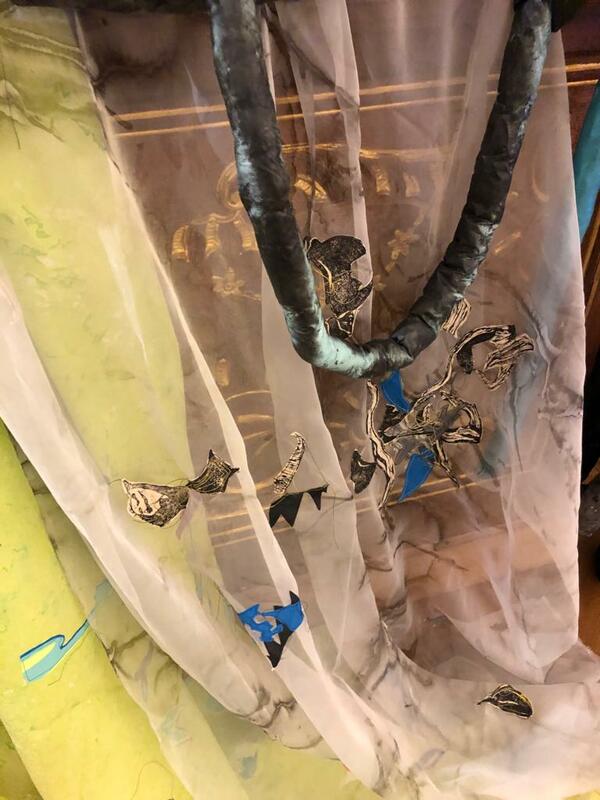 You will see a few objects that belonged to Queen Marie of Romania, starting from paintings commissioned by her, furniture designed by her, a few pieces of her jewellery, books she written and painted, everyday objects and to finish, the crown and cloak she wore for her coronation day, October 15th, 1922. For Romania, the exhibition, is a great achievement and if you are interested in this sort of stuff, know that there is another Romanian exhibition at Louvre, in Paris, with Byzantine Embroidered Textiles. The location of the "Marie of Romania, queen and artist" exhibition is gorgeous. The Palais du Tau was the palace of the Archbishop of Reims. It is associated with the kings of France, whose coronation was held in the nearby cathedral of Notre-Dame de Reims. The admittance fee is 8 euros and the visit lasts about an hour. Recently my Instagram feed got flooded by pictures of daffodils posted by the people I follow in Luxembourg. 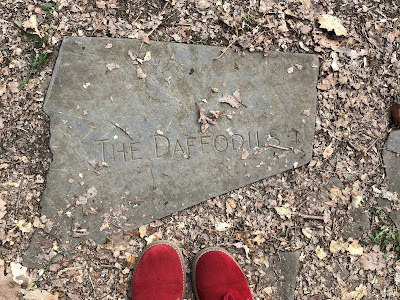 I (we) had to see the daffodil forest so I've started researching how to get there. I'm writing this article so you will not go through all that trouble. 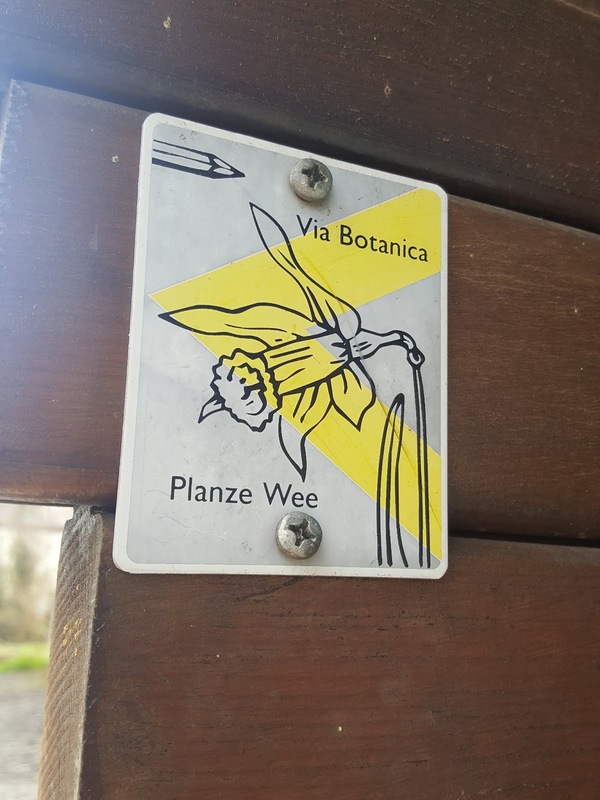 Via Botanica starts in Lellingen, a small village in the northern part of the country and about an hour drive from the city. 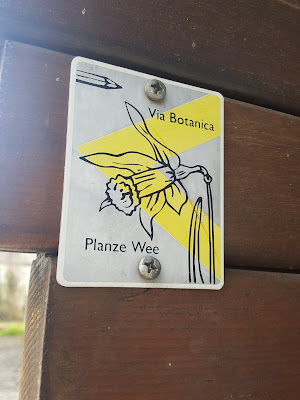 Apparently, as I've found out from an article written in 2009, Via Botanica is known as a hiking trail and only recently was discovered by the photography enthusiasts and Instagrammers. It has 7.58 kilometres and my advice to you is to wear proper hiking/walking equipment, meaning at least some walking shoes. I did it in my fancy red boots and it wasn't that hard, but as I'm writing this my feet hurt more than my husband's, who on the last thought changed his footwear. I am definitely an Instagramer and not a hiking aficionado. 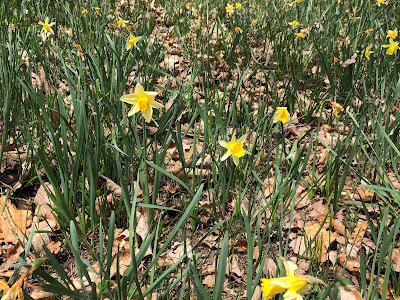 Second, if you want to photograph or just experience walking through the daffodils, go to the Via Botanica earlier in the spring. It all depends on the weather, so it isn't a clear maker in time to go and see the Daffodil Forest. 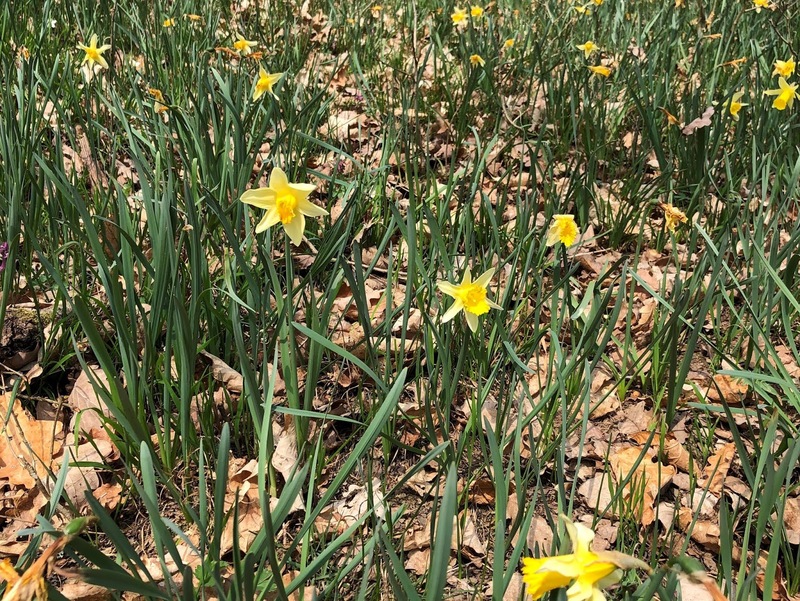 Just keep an eye on social media and go on the first sight of daffodils in your feed. We went there in the weekend (so April 7th) and the daffodils were drawing their last breath. 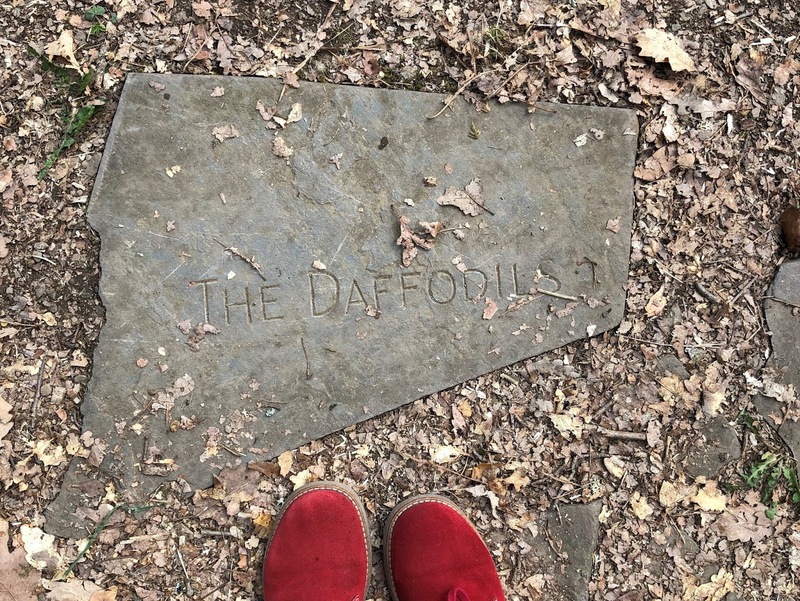 Third, follow the daffodil sign. The trail is clearly marked throughout the forest, so even for an inexperienced hiker as we are it is easy to follow it. Still, I think the trail is nice even without the daffodils, as you have a lot of places to stop and enjoy the nature and maybe have a snack. Be aware though not to litter as there are no litter bags on the trail, you will have to take your garbage with you. The trail is dotted with benches designed by the artist Alan Johnston, at some point you will spot the poem "I wondered lonely as a cloud" by William Wordsworth and a haiku by Osaki Hôsai carved in Japanese, Luxembourgish and French. The trail is a loop that starts and ends in Lellingen. We found there a cosy cafe and parking, so you will not have to worry about those little things that make or brake an experience. I will leave you with my pictures and I hope I've inspired you to go in the nature and experience it at least on the weekends. 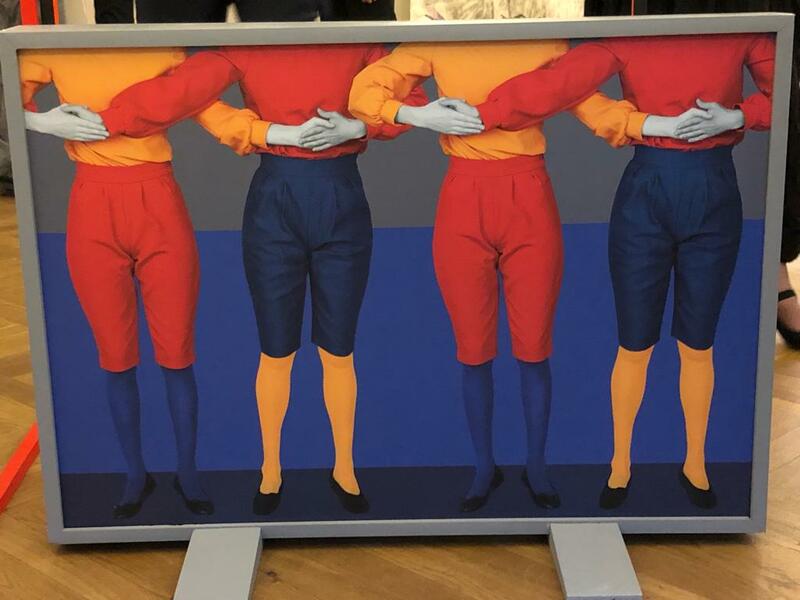 Under the title Mythologies, nine Romanian contemporary artists showcase their works in Luxembourg. 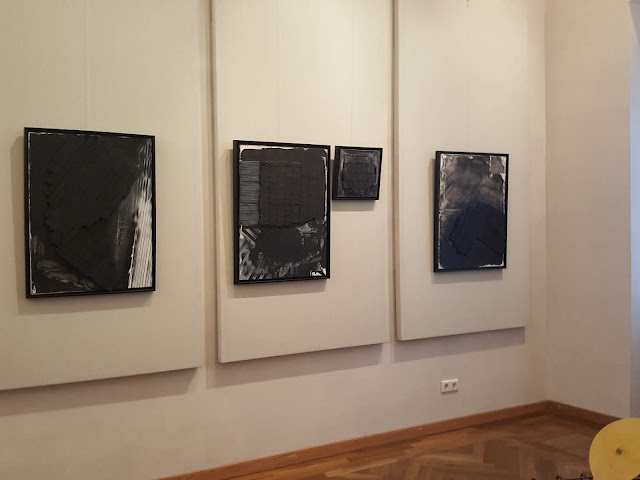 At the Neumunster Abbey, a place with great importance in the recent history of Romania (it was there that in 2007 the former communist country signed the treaty to become an EU member state), until April 15th, you will be able to admire their works, as they are exhibited in the "Chapelle" room. 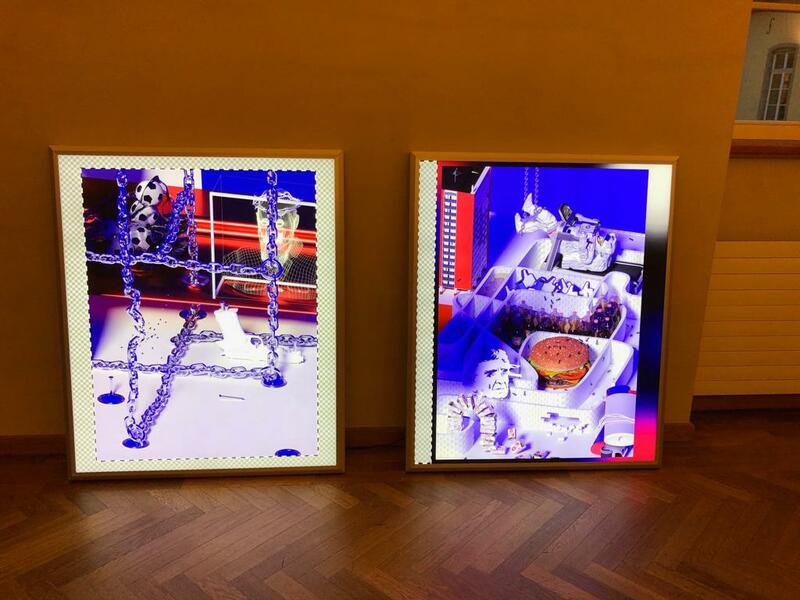 The artists experiment with different mediums, such as textile, photography or light boxes. The exhibition was organised with the support of the Romanian Embassy in Luxembourg and the Romanian Cultural Institute and it is part of a series of events organised by Romania as it holds the Presidency of the European Union Council, until June, this year. Exhibition is opened daily from 11 a.m. to 6 p.m.. I've spotted this statue on Instagram a couple of weeks ago and promised to go see it in the future, living in Belgium and all. And as it happened, on Friday I got an urge to go smell the sea, booked a room and on Saturday afternoon I was walking Luna on the sand dunes near Knokke in Belgium close to the Nederlands. It was nice, relaxing and if I find a story to tell about the Belgian seaside in the spring/winter it will probably make it on the blog. 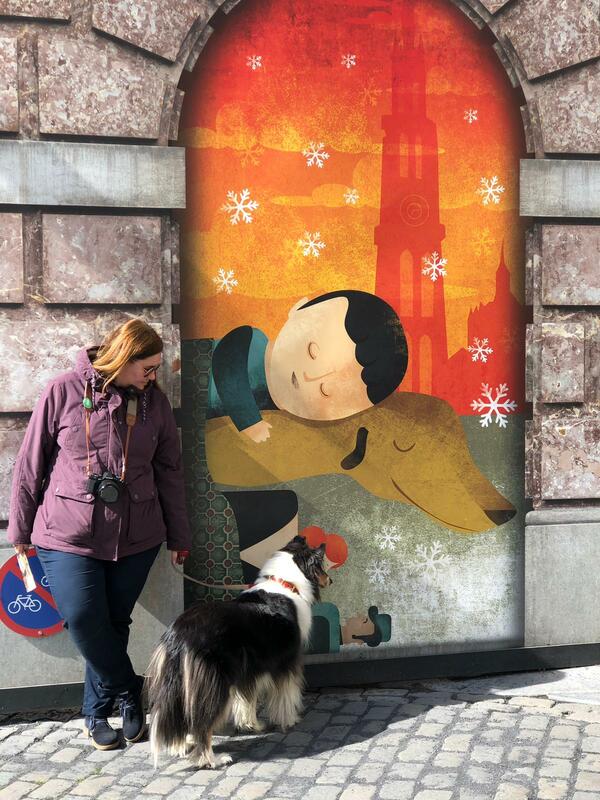 But as there isn't much to do at the seaside at this time of the year, on Sunday we checked Gent and Bruges and on Monday we went to Antwerp, to see the statue. To be fair I've always wanted to see this new type of statues, integrated into the landscape, cause you have to admit it is unusual. And also it fits the story. And the story is the one of Nello and Patrache, the characters in "A dog of Flandres". Nello is a young orphan raised by his grandfather in a town near Antwerp. One day they rescue a beaten dog and name him Patrache (it sounds more Romanian then you care to know). They grow up together selling milk and after a series of unfortunate events, they both freeze to death in the Antwerp cathedral or outside it. So that is why the pavement blanket makes sense for this statue. Spoiler? Go read the book! The tale also has it's own story. It was written in 1872 by an English author, became famous as a children story in South Korea, Japan and the Philippines, to the point where it is seen as a children's classic. But being based in Flandres namely near Antwerp, got discovered by the Belgians in the 80's and in 2017 this statue was commissioned. And indeed the square was swarming with Asian tourists, but there was no leaflet at the tourism office and frankly the person working there was very intrigued of me, an European asking about the statue. He pointed me towards something written in Japanese and sent me on my way. That's how tourism functions in Belgium, I guess. "You reap what you sow", I guess and to be fair, Antwerp is not on my favourite list, frankly none of the Belgian towns are. Yes Brussels is the capital, but it is filthy and crowded and the crime rate has skyrocketed, Bruges is very touristy, also crowded, it has some flavour to it, but not that much, Gent is the uncovered precious stone, with a castle in the middle, with cobbled streets and nice museums, but it tends to get very crowded, very fast, and that leaves Antwerp, which to me looks industrial and unvisitable. A question of taste, as I always get into arguments with the people in love with those cities. And to answer your next question, I love Amsterdam, I love the countryside even the one in Belgium, I even like Rotterdam the most industrial city in the Nederlands, between Paris and London, I will always choose the latter without a doubt, between France and Germany, I will always choose Germany...well you get the point. I am lucky enough to live just a couple of hours away from all of those cities and form an opinion not based on that first one romantic visit we all take. A question of taste, as I've said. 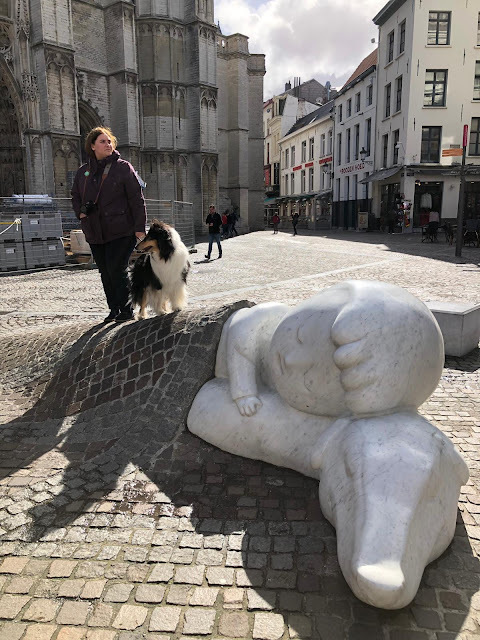 Going back to the statue, the white marble monument of Nello and Patrasche hugged together under a blanket of cobblestones was created by the local artist Batist Vermeulen, and payed for by a Chinese diamond trader. It was unveiled in December of 2017, in front of the city’s cathedral. That is where I've found it on a cold and rainy Monday. The cathedral was being renovated as it seemed all the city of Antwerp is, so I simply could not find a good angle to photograph the statue. My husband took a picture of us while I was searching all the angles and that is what you see right now. Don't get me wrong, you have an industrial and let's face it, ugly, city as Antwerp, you have to capitalise on any nice, charming story. And we two (three if you count Luna) we stopped there on our way home, we payed the expensive parking, we spent a buck or two on a coffee, I would even have bought a nice magnet if there was one with the statue. I am sure the Asian tourists spent even more on the city and I've heard they are very much into shopping and Antwerp offers that as well. Tourism well done and Chapeau! to the Belgians for this one. I love to connect with local, ancient traditions wherever I live. In Dublin I went from a spectator at the St. Patrick's Day parade, to a volunteer and then a coordinator, in my hometown I took part in a local pottery fair almost every year, it was the place where I was first introduced into the art and craft of pottery and tried for the first time a potter's wheel, so it made sense to do the same here in Luxembourg. The tradition is not singular to Luxembourg as all the neighbouring countries (except France) have their form of carnival, but everywhere it has the same meaning, it is the party before the lent, a time to wear costume and act silly before the celebrations related to Easter. In Luxembourg the carnival is called "Fuesent" and tradition dictates that the first carnival is the one in Diekirch. Also known as Buergbrennen it is a pagan ritual related to the spring solstice. 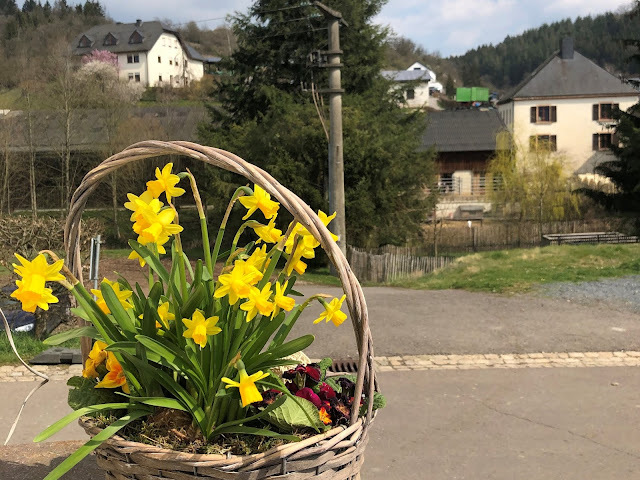 Strongly connected to Luxembourg's agrarian past, the Buergbrennen symbolises the burning of winter and welcoming of spring. It consists in burning a pile of wood and the remaining of the Christmas trees, usually shaped as crosses or as castles (buerg = castle). Also a local celebration related to Easter and lent, the Pretzel Sunday (Bretzelsonndeg) is breaking the fasting, which is a 40 days of eating mostly fruits, vegetables and occasionally fish. All I know about it is that it brings good luck to eat a pretzel on that particular Sunday and that of course it is a celebration for the pastry chefs. The pottery whistles shaped as birds celebration takes place every year on Easter Monday. It is a way of getting out of the house after the Easter feast, traditionally celebrated within the family. The Péckvillercher are hand crafted whistles shaped as birds and they are sold at the ceramic fair organised with this occasion in the centre of Luxembourg City and in the small town of Nospelt. In old times Luxembourg was a very prosperous pottery centre and its core was in Nospelt. There you will find a pottery museum and discover the history behind this local celebration. Organised after Easter the race consists of thousands rubber ducks which float on the Petrusse stream in the Grund area. They have numbers on them and the first duck to arrive wins a price. It is organised for charity and I think one duck costs 5 euros. Luxembourgish people celebrate on their National Day the Grand Duke's birthday. Although the actual Grand Duke was not born on June 23rd, the date was kept after the Grand Duchess Charlotte, the grandmother of the duke. They organise a torch lit procession and a grand fireworks display enjoyed by locals and expats. BD is Bande Designee or Comics and the festival takes place in late July in the town of Contern in western part of Luxembourg. For a whole weekend the town is closed to cars and opened to the BD fans from all over the area. They have cosplay competitions, meet-ups with celebrities from this field, BD magazines sales and many other interesting things. Also related to their agrarian past, the Schueberfouer is the summer fair, it has a tradition of over 600 years and it was the place to sell your garden produce or your livestock. In our days it is a fun fair with roller coasters and food stands organised for eight days in the Glacis area. The fall traditions are all related to the earth products which are harvested in this season. One of them are the walnuts from which the Luxembourgish people make from gems and bread to alcoholic beverages. They meet for a weekend in Vianden, which gets very crowded very fast, but it is the only place from where to buy the famous walnut liquor traditional to this area. This celebration is usually held on the second Sunday of October. The apple orchards in Steinsel are renowned in the area and one of them organises this apple picking festival. People come there to pick apples for which they pay by the kilogram, but it is a fun day out with the family, children enjoy playing in the orchard. There are also apple pies to be bought or you can squeeze your own apple juice from the apples you picked from the orchard. Less interesting for the kids, but equally fun are the Wine Tasting Events organised by various wineries on the Moselle Valley. In essence there is a walking tour of the winery followed by a tasting. Occasionally they bring local bands for entertainment and it is also a nice day to be spent out if it doesn't rain. Organised on the last weekend of September the Steampunk Convention is well known among the fans of this genre. For the rest of us it is a fun weekend spent in the sun on the deserted tran station in Fond-de-Gras. They have vintage train rides, animations and live music, visits of the mines, souvenirs and foods and beverages. Halloween is not a local celebration, but instead in Luxembourg they have Mantelsonndeg. So on the Sunday before the All Saints Day all the shops in Luxembourg City are opened and the coats prices are a little bit reduced as the locals like to buy new coats for winter in that particular day. According to legend, that was the only day the rural population working on the countryside had a chance to shop for a new warm coat before the All Saints Day when traditionally people visit the graves of their loved ones. 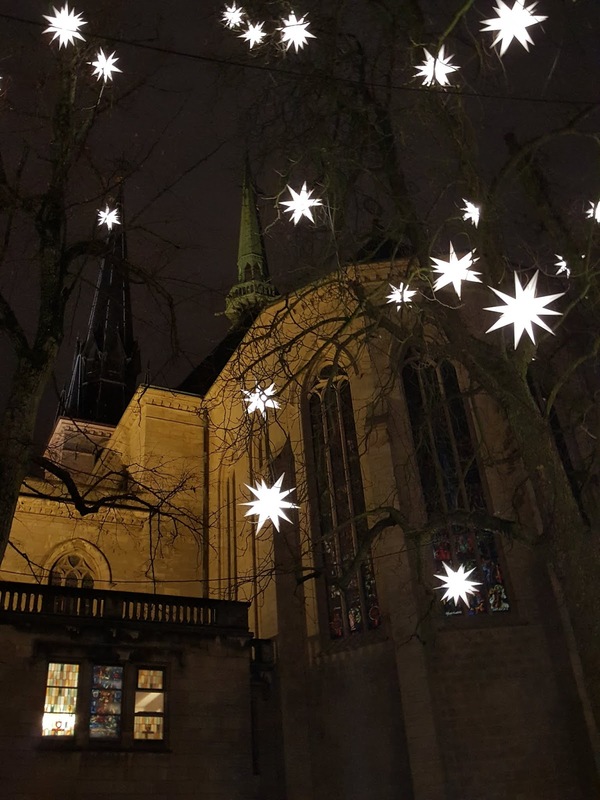 Every village and town in Luxembourg organises a Christmas Market. Big or small, opened the whole month of December or just during weekends, it is guarantied that you will find there small crafts, Christmas decorations, grilled sausages and mulled wine. Although it is a tradition imported from Germany, the Christmas Market is organised in Luxembourg and all the neighbouring countries. One thing though, in Luxembourg the market closes on December 24th so during the Christmas time Luxembourg is not a fun town anymore as the locals prefer to spent the holidays within the family or in exotic and warmer places. 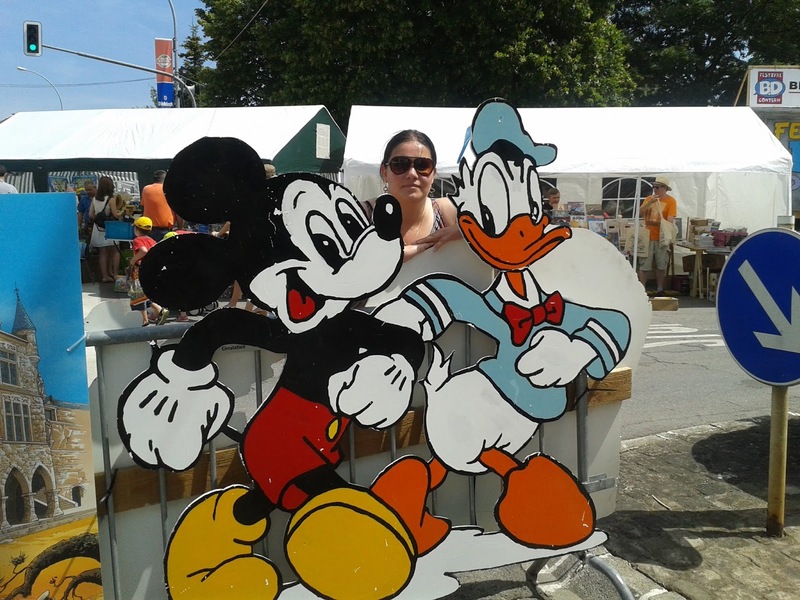 In Arlon the local celebrations are similar, they have the carnival in the spring and the Christmas Market in the winter, but they also have the Maitrank and the sumer braderie. Celebrated on the forth weekend of the month of May, the Maitrank is a local wine made not from vine but from a flower called sweet woodruff, which to me is very similar to hemp. Its recipe is a guarded secret and the drink is served with oranges and other spices. The highlight of the celebration is making a fountain serve this flowery wine. The Arlonais have a big celebration in the middle of the town with live music, finger food and of course this flowery wine. Braderie is the flea market and it is organised on the first Sunday of each month from March to November on the streets of Arlon. What they do, is close all the city centre to cars and open stalls for people selling antiques or old or vintage stuff. If you are into such a thing or even if you, like me, like to just stroll around, it is a fun thing. I think it is also a window into the past of this area and I like to look at what people used to decorate their houses with or used in their everyday lives, long ago. As inspiration I've used this article which at the end has references to other festivals and traditions from other countries.